As we rode around the vineyard property (all 500+ acres; 220 under vine) with Alexandra (“Alex”) Macari, we learned of some of the Native American heritage the land holds, and the deep rooted respect for the soil. We also learned about the Macaris’ long-term efforts to be biodynamic and organic (at least to the extent possible) to nurture healthy and vibrant grape vines. Alex pointed to a wooded lot which holds hundreds of buried cow horns, a method for making natural fertilizing teas. She pointed to a contraption in the center of the vineyard which focuses positive energy into the soil. 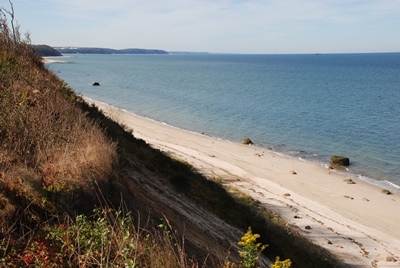 She drove us to the bluffs which overlook the Long Island Sound at the rear of the Macari property- an important source of cleansing breezes. And as we made our way back from the vineyard to the tasting room, we passed the animal paddocks housing steer, chickens, goats, and more – important sources for their homemade fertilizer. It is important to note that, while Macari does follow many/all of the biodymanic farming practices, they are also very sensitive to the common exploitation of those terms. Macari admits that at times conventional chemical sprays are necessary, and as a result they avoid formally (or even informally) labeling their wines as biodynamic or organic. 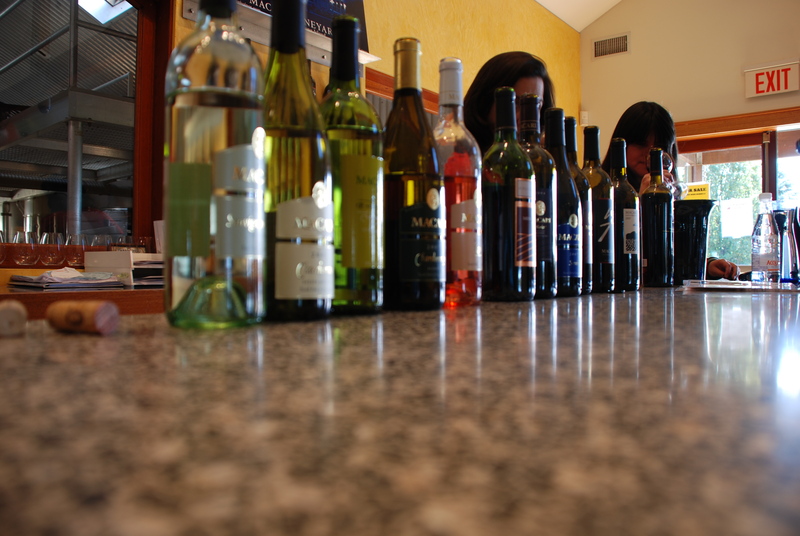 After our tour around the property, Alex saddled up to the tasting bar with us and poured through their current lineup. Joining us for our tasting was one of Macari’s primary winemakers, Paula from Chile. On the whole, we were impressed with consistent quality of the wines, not to say we loved every one, but the winemaking style was clean and unobtrusive. 2008 Sauvignon Blanc – $22.99 – beautifully tropical nose, with a touch of “sweet” grapefruit on the front of the palate, followed by a bit of peach and Asian Pear. Great acid, clean finish! 2009 Early Wine – lots of green fruit, touch of sweetness which was surprising because of the bone dry finish. Appley aftertaste. 2007 Reserve Chardonnay -$22.99 – (12 mos. French Oak) hint of vanilla and baking spice, lemon custard, Asian Pear and hay. Full body, very well balanced. Collina 48 Merlot – $12.99 – (3% Cab Franc) spicy with black fruit and leather notes, medium body with a soft velvety finish. 2004 Merlot Reserve – $35.99 – earthiness & black pepper, black cherry, black currant and boysenberry with hints of wet cedar. Full body, great tannins – very nice. 2007 Syrah – $34.99 – huge fruit up front, most dark with a hint of red currant shining through, black pepper, tar and graphite, all rounding out the mix. Very full body, kept expanding on the palate. 2007 Malbec – great cola and raisin on the nose, very cherry filled, but slightly “green” tasting and floral towards the finish. 2004 Bergen Road – $42.99 – (42% Merlot, 29% Cab Sauv, 24% Malbec, 5% Petite Verdot) – cocoa, mint, “sweet” black fruit, tobacco leaf (raw). Beautiful acid and tannin integration. After tasting we took a walk through the tank and barrel rooms with with Alex and Paula, and even saw a little fruit being pressed. 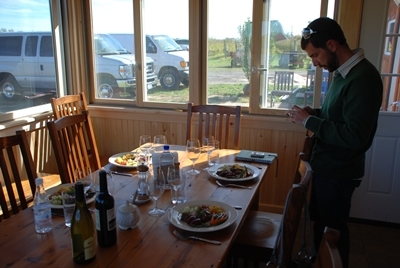 Following the tour, we were honored to join Alex, and her husband Joe, and their biodynamics manager for lunch. They prepared an amazing lunch for us– a huge vegetarian spread, including a second course of pasta and a cheese course to finish it off. 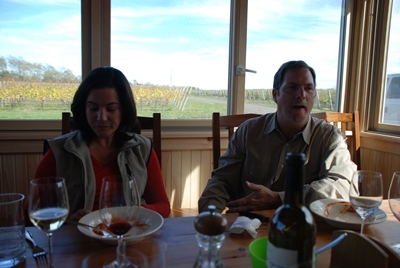 It was great to sit and talk with Joe and Alex and learn more about them, their family, and their wines. Thanks to them both for showing us a great time.